Casey Hensley’s big family included Candye Kane until last year. To help launch her career internationally, North County blues belter Casey Hensley turned to Vizztone Records’ more streamlined approach to market her first album, Casey Hensley Live, featuring Laura Chavez, released three weeks ago. All Vizztone artists are responsible for their own recording and pressing. “We only focus on distribution, promotion, and publicity.” Rosenblatt says, unlike other labels, Vizztone does not get involved in the sometimes-messy arrangements where labels own the master recording or songwriting rights. Rosenblatt says Vizztone relies on North Carolina’s Redeye Distribution for worldwide distribution. The Vizztone/Hensley arrangement was helped along because Hensley’s drummer/life partner Evan Yearsley knew Vizztone co-owner “Steady Rollin’” Bob Margolin, a bluesy guitarist who had long been connected with Yearsley’s mom, Candye Kane, who died last year. The album was anchored by the guitar cred of Laura Chavez, who played on Kane’s last studio album, 2013’s Comin’ Out Swingin’. 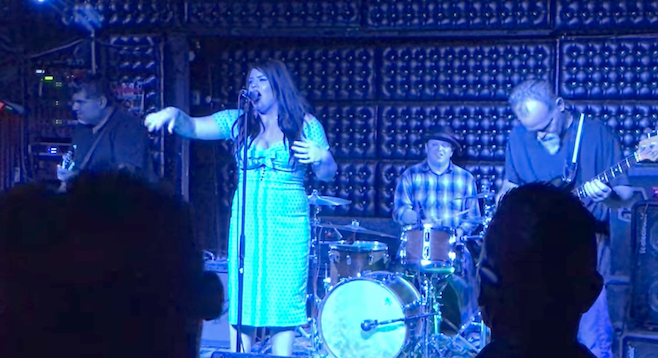 And the album was recorded live in one take at Thomas Yearsley’s Thunderbird Analog Recording Studios in Oceanside last December (Thomas is Evan’s dad and Candye’s ex).